Now there wasn't too much to this sketch so that gave me a bit of scope for artistic license which I hope paid off! My friend has just had a little girl: Evie (I'm very jealous as I wanted another girl!!) which gave me an excuse to go all pink and glittery (yey!). I used one of my favourite images from Lili of the Valley and pulled out all my baby girl papers and went to town! The sentiment is by Lili of the Valley too. So congratulations to Jenny on the safe arrival of baby Evie - two girls hey, your house will be pink forever more! Matt you may as well move out now! 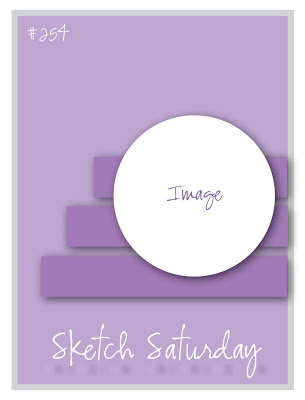 This week's Sketch Saturday sketch is sponsored by Simon Says Stamp who are offering a prize to pop on over and join in. I would love it if you would come join me on my new blog as I post there almost every day now!